Big Bench Secrets: Make Your Muscles Scream With The Following Routine and Tips! 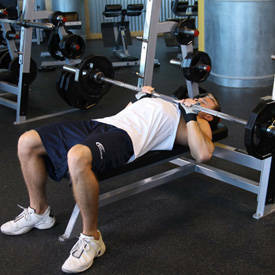 Have you been stuck at the same weight on your bench press for a long time? Here are tips and techniques to help you. 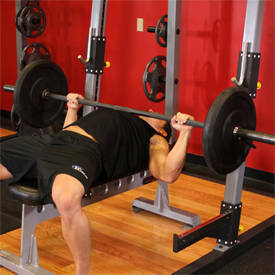 Have you been stuck at the same weight on your bench press for a long time? Wait no more. It's time to add some weight to that bar and make it bow! Many guys have been training for years and have become complacent with the amount of weight they use during bench presses. You might be one of them. When's the last time you added an extra "wheel" to the barbell? You might be pushing the 135-, 225- or 315-pound barrier. Regardless of the amount, it is time to smash your personal record and move some heavy weight! The love of the mighty bench press is easily understood. No one ever comes up to the biggest guy in the gym and asks," How much do you lunge?" No, people want to know how much he benches. That's the first question anybody asks a bodybuilder, weightlifter or powerlifter. The overhead press used to be the king of the lifts back when Olympic lifting was still performed at gyms. Yep, the good ol' press over the head while standing was the king of lifts for decades. As Olympic lifting began to fade into obscurity, the bench press, in the world of powerlifting and bodybuilding, began to gain popularity. Soon every high school football player wanted to know how much they could bench. And now so do you. My brother, Brent, just blew up 6 reps with 440 last week, but I've never been super strong in the bench press. Okay, let's get it out of the way. I bench 325 for a one-rep max. There I said it. Now you know so you're not wondering any longer. I did that about two years ago at a body weight of 180-85 and it was something I had wanted to do for a long time. I had pushed up 300 when I was 20, but I have had a number of nagging shoulder injuries over the years. I wanted to press three wheels on each side, but at one point, because of the pain in my shoulders, I just gave up doing bench presses completely for more than five years. I was still training during that time, but I wasn't doing flat-bench barbell presses. One day I decided to try doing bench presses again and came up with a game plan to bench 315. After a few months of diligent and intelligent training, I reached my goal of 315 on the bench. A year later I did 325. Let me share the secrets with you so you can push up a few wheels too. I'm going to make a few assumptions. My guess is that you train chest on Mondays, which is the universal day to train chest. You do bench presses first in your routine and you do a warm-up set of 15 or so with a weight that makes your triceps start burning after rep 12. You add about 25 pounds and do 12 more reps and the last rep was tough. You add more weight and plan on knocking out 10 reps but you only get 8 or 9. You add more weight and hope to get 8, but you struggle with 5 and have your partner give you 2 more forced reps just to get 7 reps. Now your arms are tired. They start to shake and your chest is tight and, yet, you add more weight. This set is the toughest and you get 1 or 2 good reps and another 1 or 2 with help. You decide to do one more set and you barely squeak out one and then your partner now does three reps of what is basically a really heavy curl just to keep the weight moving for you. For good measure you do one more "pump set" and strip 20 pounds from the bar and think you'll get 10-15 reps but get only 4 or 5. That's it for the bench press and you move on to the next exercise. This has been your typical Monday for at least three years. Same weight. Same reps. Same old, same old. Feeling stagnant? Does this sound remotely familiar? I thought so. We're going to change things. First of all, before you begin this routine, take an entire week off from training. Yes, a whole week. If you want to do some cardio, that's fine. But no weight lifting. Giving your joints, muscles and various connective tissues a rest is a very good thing. In fact, I strongly recommend taking a planned week off every two or three months. I know that's hard to do for some of you, but, in the grand scheme of things, one week is not that long of time—really! After one week's rest your shoulders and elbows should be rested and feel pretty good and they'll be ready for some intense work, but you're not going to jump right in with high-intensity training. No, that's the way you've probably done things in the past. We're going to ease into it, gradually increase your weights, your training intensity and actually get you stronger this time. This routine is for three days per week. Now, for all you guys who train five to six days per week, relax! We're concentrating on increasing your bench press strength. The less you train the more time you have to recover. 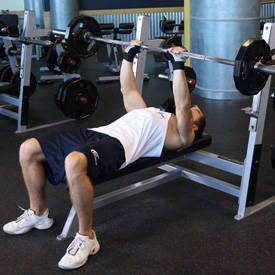 I see many guys training chest twice a week and include heavy bench presses in both workouts. Guess what? They are not the biggest or the strongest in the gym either. The big powerlifters who train chest once a week and are at the gym only three days per week are the biggest and strongest. There is a correlation here. Since Universal Bench Day is on Mondays, you will train legs on that day. Why? That's easy. The benches will more than likely be open on Wednesday and you won't have to wait to use them. Dig down deep and make yourself switch days. It'll be okay. Trust me. You'll be alright. Really. Mondays will be devoted entirely to legs and Fridays will be utilized for back and biceps. Wednesdays are for concentrating on the bench press and you'll be hitting chest and triceps on that day. I'm sure you noticed something. No delt work. What about getting cannon ball shoulders? This routine won't have any direct deltoid work, except for rear delts on back day. There will be no side or front lateral raises. Your front delts will be getting plenty of work when your weights shoot up on the bench press. Shoulder joints need sufficient rest to recuperate fully. If you think about it, the shoulder joint gets blasted four to five days per week in most routines. Shoulders are involved in military presses, laterals, all chest work, and all back work. Instead of delt work, per se, this routine concentrates on heavy benching and strengthening the rotator cuff, which is a support and stabilization muscle that holds and balances your upper arm and provides counter balancing for it. There are many examples of rotator cuff exercises here on Bodybuilding.com. Pick two exercises on Wednesday and two different exercises on Friday. Use very light weights and keep the reps at 15. This is best for these important muscles. The rotator cuffs need to be coaxed, not blasted! Don't worry about increasing weight, just keep the reps high and stay consistent with the exercises. Remember to do these rotator cuff exercises AFTER your workout is completed. Do not use these exercises for a warm-up. Use them as strengthening exercises when you're done with all the other exercises. People make the huge mistake of doing these first and tiring the rotator cuffs out before you begin the heavy stuff of your workout. Training them first is not a warm-up; it's an invitation to injury. Don't weaken the weak link by tiring it out first. If you're still not convinced of doing less work for the old shoulders, take a lesson from Will Harris and all the guys he trains. He does not train delts in the off-season at all. He doesn't train arms either. Chest is one day. Rest a day. Back is the next day. Rest. And legs are on the third training day. That's it. Seems to work pretty good for him and he's something like 357 years old, right? One of the biggest fears in bodybuilding is tearing a pec during bench presses. Many guys have done that over the years. Tears normally occur from not being warmed up, bad technique or form, too much weight, or from overtraining, which causes you to be susceptible to injury. Technique will be our first topic to cover. Most conventional bodybuilding wisdom teaches that the grip on the bar during the bench press should be fairly wide to allow the elbows to be held out away from the body to allow a full stretch to the chest and isolate the pecs so the triceps and delts are used less in the movement. This technique, however, does not allow maximum weight to be used and it puts the shoulder joint in an unnatural position. It also puts unnecessary stress on your pecs and makes you open for a tear. If you want to concentrate on power and strength, the grip needs to be narrower and the elbows need to be closer to the body. Yes, the triceps will be used more, but this position gives more driving force and it's safer. Your grip should be about shoulder width. I like one thumb-length from the beginning of the knurled surface of the Olympic barbell. Slowly lower the bar to the bottom of your pecs and drive it back up. You don't need to pause; just do it touch-and-go style. And absolutely do not bounce the bar off your chest - ever! Even though the bench press is what this article focuses on, chest day starts with incline presses. Why? To get you warmed up and ready to bench. Do a couple light sets of 15 to 20 with light dumbbells and then go into your working sets. The weight should not be so heavy that you are struggling to get the final reps on any of the sets. We're not training to failure. The purpose is to pump some blood into the upper pecs and get the shoulder joints warmed up. Now it's time to move onto bench presses. The routine calls for three sets of six reps for the bench presses. These are your working sets. You will do warm-up sets first. Since you have taken a week off and you will be following a new technique for the exercise, you need to invest the time to do it right. Starting over is the way to sum it up. Let's say you want to bench 225 pounds. You've done maybe 210-215 in the past. First of all, even though you've done one exercise already, get used to doing a warm-up set with the empty bar. Do 15 to 20 reps with the 45-pound bar. After that set add a 25-pound plate to the bar and do eight reps. That's the warm-up. Strip off the 25-pound plate and replace it with a 35-pound plate. Do three sets of six reps with that weight. Do not go heavier and do not add any reps. Let me guess. You can do a lot more, right? That's not the point. The point is to re-learn how to do the bench press so you get stronger than you have ever been before. Next week you will add five additional pounds to the bar and again do three sets of six reps. When you reach about 150 pounds, add another warm-up set with 135 pounds after your set with 95 pounds and do four reps with 135 pounds. Keep adding five pounds each week until you begin to struggle getting six reps on all three sets. My guess is that you will be at about 175 pounds when this happens. The very next week, add five pounds to the bar and do five reps for three sets. Add five pounds the next and do three sets of five again. At some point you will not get the five reps. If you only get four reps, that's okay. Do three sets of four. When you get three sets of four go to three sets of three for a couple weeks. Finally do three sets of two reps. At this point, you should be using around 210-215 pounds. The very next week, try an attempt at 225 or maybe even 230. As your weight increases it's important to throw in a few more warm-up sets. These shouldn't be taxing, but they'll get you acclimated to the heavier sets. These sets, therefore, are called "acclimation sets." After your initial two to three sets with the bar and 95 pounds, add a set with 135 and do four reps. Add another 20 pounds and do two reps. Add another 20 and do only a single rep. This gets you used to higher poundage, but it won't burn you out in the process. To give you more power, add some triceps work. Close-grip bench presses are king here. Do not put your hands too close together. I see guys doing this exercise with their hands touching. This is a great technique if want instant chronic wrist pain. Keep your hands about one foot apart and you'll be doing fine. Use a weight that allows 6 reps for 2 sets. Don't go to failure and do not use forced reps. These should be all you and not your partner. Throw in some push-downs and maybe some lying French presses and you're good to go! Hopefully you have gained some valuable information that you can apply to your workout to help increase your bench press. The key is to be patient and start with light weights and work your way up gradually. I did this exact routine a few years ago and I still follow these principles. I started with 135 pounds for three sets of six reps and patiently worked my way up to two reps with 295 and a single with 325. Whether your goal is 135, 225, 315, 405 or more, apply these principles and you'll be on your way to smashing your personal best in the bench press!